Justina was "a virgin of nobility and dignitaries, a pure bride of Christ, an animated statue, an undisturbed offering, a sacred inviolable, a garden closed and sealed, a wellspring preserved only for Christ" (St. Gregory the Theologian). She, who was inviolable and modest, became the love interest of a pagan, and because it was impossible for him to make her his he thought up a satanic method to acquire her. He begged Cyprian to change her mind by means of his magic and bring her near him. Cyprian, who had done this before, considered this an easy job, since he believed the power of demons was able to overpower her. But despite his efforts, this time he failed. Justina, because of the purity of her life and the power of her prayers, drove away the demons who were unable to cause any damage in the least. They returned defeated and ashamed and told Cyprian they were unable to do anything, since the girl was protected by a power higher than theirs. This shocked Cyprian and it became the reason for him to abandon his idols and magic, and to come to know and experience the life of the Church, thus freeing himself from the tyranny of the devil and coming to feel authentic freedom, "the freedom of the children of God". Whoever serves Christ and keeps His commandments tries to conquer and transform his passions, and is freed from the tyranny of the passions and the devil and acquires inner freedom, which is true freedom. The work of the Church is to abolish the works of the devil. Christ, the second person of the Holy Trinity, became perfect man to redeem man from the dominion of the devil and death. Dealing with magic enslaves man to the devil. Of course, those involved with magic argue that there is a difference between white and black magic, good and evil spirits. But this is not true, since according to the teaching of the Church there are no such thing as good and evil demons, but all demons are evil. In the beginning they were angels, since God created nothing evil. Due to their pride they fell from heaven, were removed from immateriality, acquired material stoutness and became dead spirits, who kill all those that approach them. According to Patristic teaching there are evil and wicked spirits. The thinner demons fight against the soul of man through thoughts, desires, etc., and the more material ones fight especially against the body through the passions of the flesh, so that in this way they can capture the soul. Today we are witnesses of many acts of satanism and satan-worship. 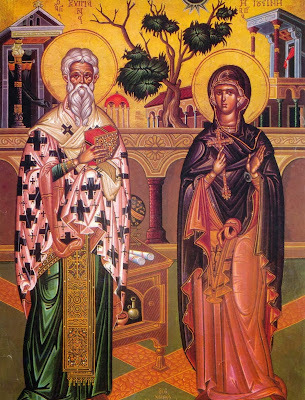 Saint Nikodemos the Hagiorite mentions that there are several types of magic, but they can be divided into three basic types: 1) in so-called satanism, by which people come into communion with demons; 2) in augury, in which animals, birds, the sun, the moon etc. are examined to discern the future of people; 3) in astrology, which too many people are unfortunately involved with due to media attention and reports of misleading science, though in reality it is the art of divination. Astronomy is science, not astrology which is something completely different. Many visit astrologers and various other magicians out of curiosity, others to solve certain problems, and yet others to learn the future. But we must realize that the devil does not solve things, instead he creates many problems and causes many and varied temptations, and nobody knows the future except God. The Church is the one that responds to all the major issues of concern to humans, and solves all their problems, in particular their existential problems such as the purpose of life, the mystery of death, the existence of hell and paradise, etc. The main reason many people become victims of satanists, spiritualists and magicians is because they are ignorant of the life of the Church and the wealth of the Orthodox tradition, as well as a lack of confidence in the love and care of the Triune God. We as Orthodox Christians have a vibrant and rich tradition and unfortunately we arrogantly ignore or despise it and wander like hungry beggars asking to feed ourselves with the suspect preparations of the subculture and the husks of sin. Nowadays there is this also: there is a magical understanding of all issues. People want to solve all their problems in a magical way, without anyone wanting to put any effort. Even the Mysteries of the Church are perceived as magical ceremonies that solve every concern without the contribution of personal struggle. The devil is expelled through prayer ("the name of Jesus ravages wars"), the experience of the Mysteries of the Church, and asceticism in grace; that is, with our personal struggle for the transformation of the passions and the acquisition of personal communion with the personal God of the Church. Our trust in the love and providence of God and the experience of the life-bearing tradition of the Church gives the means of being liberated from the tyranny of the passions, the dominion of the devil and the fear of death. Source: Ekklesiastiki Paremvasi, "ΚΥΠΡΙΑΝΟΣ ΚΑΙ ΙΟΥΣΤΙΝΗ", October 1998. Translated by John Sanidopoulos.